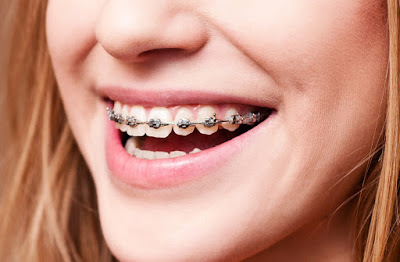 Dental braces are the best and the most comfortable solution for crooked teeth or a misaligned bite is braces. The braces work by applying continuous pressure over a particular period of time to slowly move the teeth in a specific direction. As the teeth move, the bone also changes shape due to the pressure applied. Brackets are the small squares which are bonded directly to the front of each tooth with a special dental bonding agent. They hold the arch wires which move the teeth. Occasionally, brackets are cemented to the back of teeth, to hide them from view. Orthodontic bands are cemented to the teeth with the help of dental bonding agents. They wrap around each tooth to provide an anchor for the brackets. Spacers are the separators that fit between the teeth to create a small space prior to the placement of orthodontic bands. Arch wires attach to the brackets and act as tracks to guide the movement of the teeth. A buccal tube on the band of the last teeth holds the end of the arch wire securely in place. Elastics or rubber bands attach to hooks on brackets and are worn between the upper and lower teeth in various ways. They apply the required pressure to help move the upper teeth against the lower teeth to achieve a perfect fit of the individual teeth. Face bow headgear is the wire gadget that is used to move the upper molars back in the mouth to correct bite discrepancies and also to create room for crowded teeth. The alterations made by the orthodontist make to the braces may make your mouth feel sore or uncomfortable. When needed pain relievers like Motrin or Tylenol can help relieve the pain. Thangam’s Dental Clinic offers the best orthodontic treatment in Chennai. They follow quality care and provide a trusty comfort from your dental troubles.